Interviewers are increasingly making absurd demands on applicants’ time. Here’s what to do if you’re asked to work for free. What is a ZipRecruiter TrafficBoost? If you need to get candidates in the door as quickly as possible ZipRecruiter’s TrafficBoost can increase both the visibility and traffic to your job advertisement. TrafficBoost provides increased placement for your job on ZipRecruiter.com, partner sites, and in job alert emails. Your job gets an increased ranking score, which boosts its visibility in search results. I’m having an odd time with a company and was wondering what you thought of this process. I applied to a position on LinkedIn for a communications assistant on Friday. On Saturday at 6 am(!) I got an email asking me to schedule an interview for Monday. On Sunday I figured why not, and went ahead and scheduled myself a time for Monday on their website. The emails they sent asking me to schedule the interview and then confirming the interview were odd. They used cutesy language and, whether a joke or not, told candidates to bring donuts to the interview Monday. Every so often, it’s important to take a step back and reevaluate your organization’s recruiting strategy. Even if it seems to be working well, there are new trends continually reshaping the talent landscape — and you don’t want to be left behind. If you have trouble finding the right talent, you’re not alone. According to Aptitude Research Partners, three in four hiring decision-makers say that finding quality candidates is their #1 recruiting challenge. Here are five ways you can attract more quality candidates to your open roles with Brand Advertising from Glassdoor. Six out of 10 older workers have experienced or witnessed age discrimination at work, says a 2018 report by the U.S. Equal Employment Opportunity Commission (EEOC). Ageism can impact professionals long before they start to approach retirement. In a recent survey of startup founders, 26.7% said they believe that age discrimination in tech starts when workers are between 36 and 40. CMS Says: If the employee meets the following criteria, yes, you may be eligible to obtain a Work Opportunity Tax Credit for hiring that individual. It’s official: The US economy doesn’t have enough workers. For nearly a year now, the number of open jobs each month has been higher than the number of people looking for work — the first time that’s happened since the Department of Labor began tracking job turnover two decades ago. While I’ve had plenty of practice interviewing experienced hires, I’m feeling stumped preparing to interview college students. We are coming up on campus recruiting season for interns and new hires, and I’m having trouble formulating my general interview script. Most of my go-to questions focus on past projects and experiences in different work environments. How do I translate this to students, especially the internship candidates who may not have any prior industry experience? 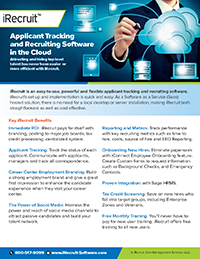 ← What is a ZipRecruiter TrafficBoost?